Sherril's Sewing Saga: What's Up Next? The Ninja Girl is done. I really enjoyed spending quality time with my Niece. I didn't enjoy sewing the costume. Stacy is my twin sister's daughter and is now living with her mom a few miles away. When she was 5 years old, they moved 500 miles away to Tucson, AZ. Luckily it's close enough that we got to visit a few times a year. I love having her back. So now you know why I worked on this costume when I have a very large deadline pressing down on me. But I'm getting ahead of myself. I'm going to share all about my next project and the deadline with you in the next post. Stay tuned! 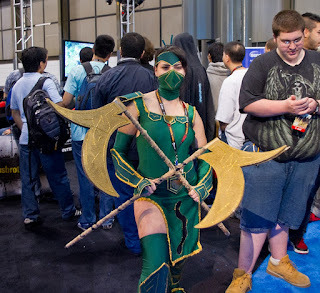 The costume is meant to be a character named Akali from the video game, League of Legends. I've never heard of it, but she's a video game geek and plays it all the time. She attended Comic-Con in New York this weekend and said that over 200 people asked her if they could take her picture including a local paper and the company that produces the video game. To make this costume, I was forced to called upon my pattern making skills. I used a Kwik Sew Tank suit and a leggings pattern. 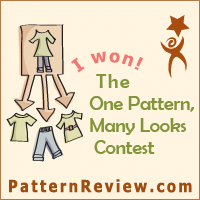 I also used Silhouettes Yoga skirt pattern to complete the look. Stacey made the patterns for the armor and I made them up using Peltex between to layers of polyester gaberdine. I used some gold gimp trim and gold thread satin stitched around many of the items. To make the belt for her very curvy figure, I draped muslin around her, pinned it to fit her contours and then drew the belt on. I'm so glad I did this because it fits her so nicely and lays against her body perfectly. I probably have 40-50 hours into this thing, which includes making patterns and muslins of the suit, the stockings and the gloves. To make the face mask, I traced her face and created a pattern. I'm very impressed on how this part of the costume came out since I had no idea what I was doing. For the forehead piece, she drew on her face and then pressed paper onto her forehead to create a pattern. She bought hair extensions and fake bangs to add to the look, including anime large-eye green contact lenses. My sister made her weapons. They were tricky because she had to be able to get on an airplane with them. I've got to remember to say NO next time I'm asked to do anything with a deadline. Instead of starting my BIG PROJECT on Saturday, I attended the ASG-LA Sew-In. In a I-Don't-Know-What-I-Was-Thinking moment, I volunteered to teach the beginner's class. While I expected three students, only one came. 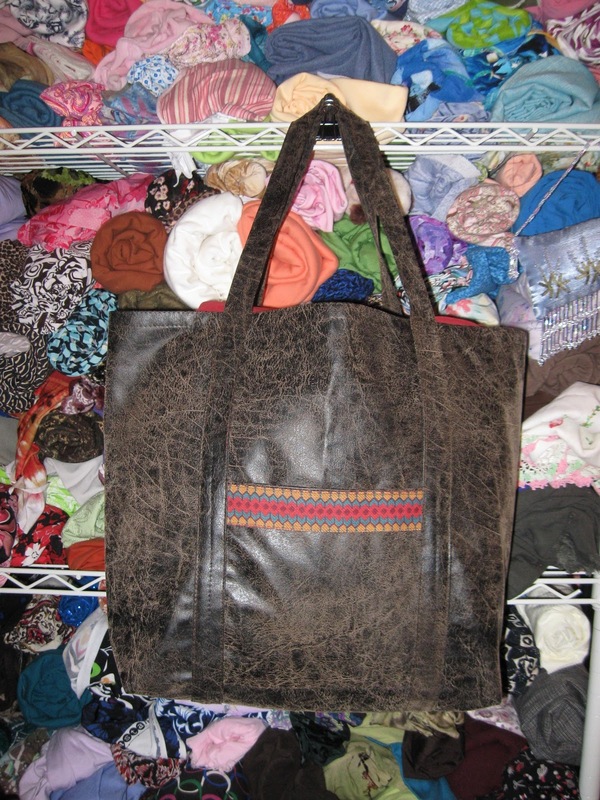 It wasn't a total waste of time because I got a chance to make this cool tote bag from sueded pleather. I love the trim, which was from a small scrap of fabric that has a striped print. I'm not sure you would have been able to see the pocket without the trim. This tote pattern is what I start all my beginning students with. It gives them many different techniques to begin with and they usually have a completed item to take home with them. Now to get started on my project, which will include six different garments to be completed by Friday. Yikes! Wish I could join in on the beginners class!! Love the simple tote, do you use any particular pattern for it? Wow, Sherril! The costume is fantastic! I know your niece appreciated it. Amazing costume. She looks just like the picture. Way to go, Aunt of the year for sure. Outstanding! on the costume. I know she was so happy. ... It cracked me up when you said "because I didn't know what I was doing..."
For not knowing what you were doing; you did a great job! I love the costume. I can totally see why it was such a big hit. This is such a spectacular outfit. It may have been time-consuming, but your niece will remember this costume and her experience in it for her whole life! You did an Awesome job and the costume fits her perfectly. Incredible job on the costume. You sure earned your props with this one. I hope you get a copy of the newspaper article. I do know what you mean about deadlines and unique projects. Talk about pressure! You sure overcame it. Great job! I hear ya about never making anything on a deadline ever again. The costume looks AMAZING!!! Great job!!! I too also hope you get to see the newspaper article. Maybe it will be online? Ditto some of the comments above. You will remember this costume over a lot of what you sew by its very difficulty. And the fact that it turned out so cool.